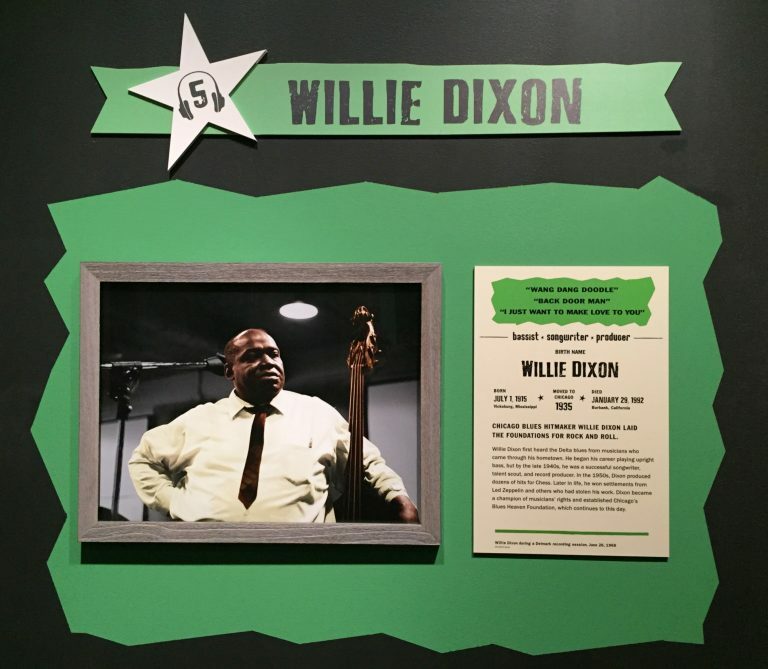 When African Americans migrated from the rural south to the urban Midwest in a movement known as the Great Migration, they brought with them a rich culture and a love for a genre of music known as the Blues. 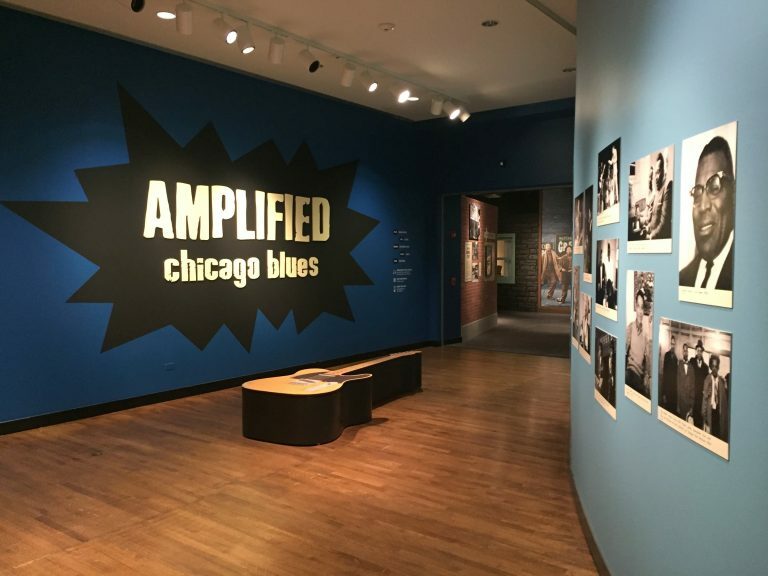 Amplified: Chicago Blues is a special exhibition created by the Chicago History Museum running through August 11, 2019. 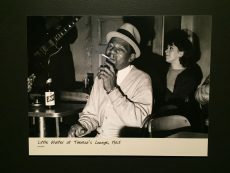 The exhibition sets the scene for blues in Chicago during the 1960s, spotlighting legends like Muddy Water, Howlin Wolf, and Koko Taylor just to name a few. 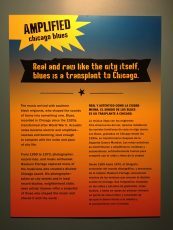 It uses the photographs of renowned photographer, Raeburn Flerlage, to examine the role Chicago blues musicians played in shaping a particular blues sound. The exhibit engages visitors in a fully immersive and interactive learning experience. They are invited to experience the blues firsthand by playing guitar, singing karaoke, writing lyrics, and even designing their own album covers. 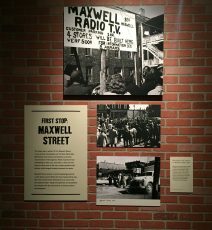 Benchmark has worked with the Chicago History Museum on countless exhibits over the years and we were privileged to be included in the process of bringing this exhibit from the drawing board to the museum floor. 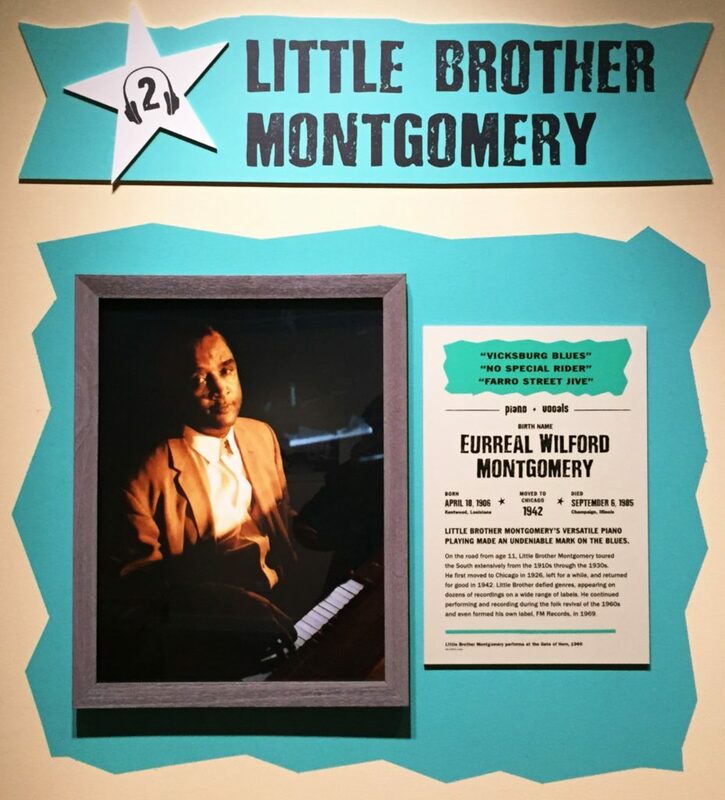 The first thing visitors see when they approach the exhibit is a giant wall graphic with stylized 3-D lettering that reads “Amplified Chicago Blues,” and a collage of lambda printed photographs on the opposite wall. Planning, curating, designing, and building an exhibition like this is a huge undertaking. The museum’s staff had been hard at work for years before Benchmark was called in to fulfill their printing needs. Mark Ramirez, the museum’s Graphic Designer, gave us some background on the work he does and how an exhibit like this comes together. Once a topic is chosen for an exhibition, artifacts and photographs are selected to support the story. 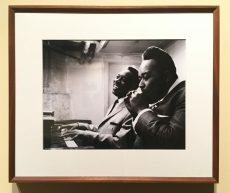 They usually come from the Chicago History Museum’s own collection, such as Flerlage’s photographs, but often are loaned by individuals and institutions, such as the Center for Black Music Research. 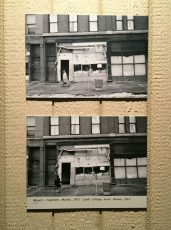 Museum-goers may not realize that the original photos are usually too small to be displayed in an exhibit that will be viewed by a crowd of people. The museum has its own photo lab to scan and electronically enlarge the photographs to sizes suitable for group viewing. Mark teams up with the museum’s 3-D designer, curator, and editor to establish the look of the exhibition and develop designs for the graphics. 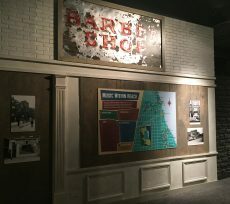 These graphics include labeling, narrative panels, wall murals, all the tricks of the trade that are experiential, engaging, and accessible to people as they learn about the exhibit’s subject. Mark and Benchmark work together to choose production methods. Mark then sends us files and we provided either digital or printed proofs for approval. That’s when we start the presses! Some of the graphics are printed directly on the substrate while others are printed on photo paper mounted to a substrate and then layered with a protective laminate. There are pros and cons to each method. Printing directly on the substrate typically saves time and money. 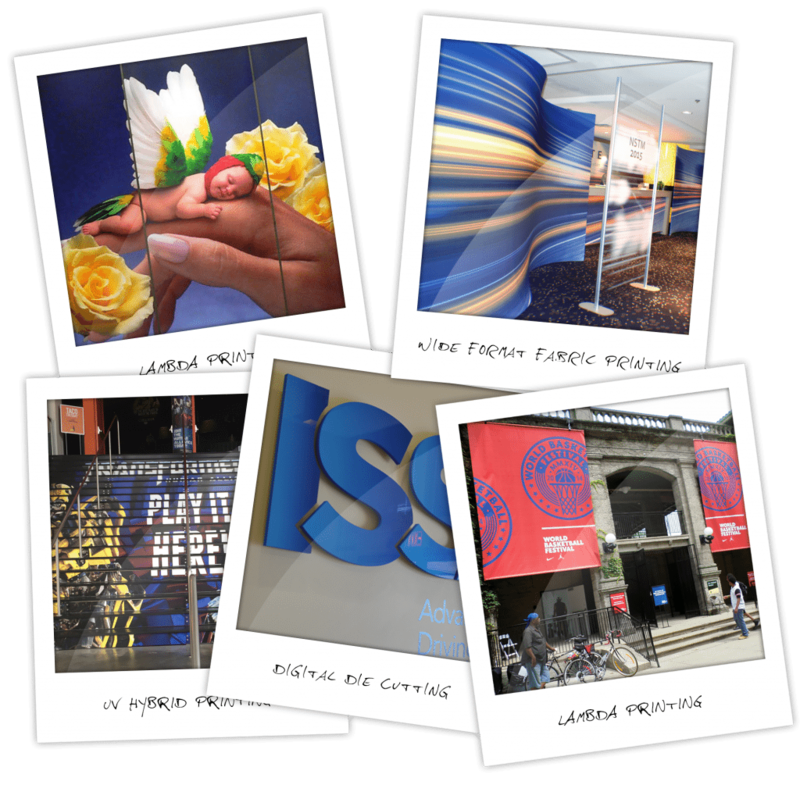 For some displays, such as oversized murals, direct printing is the best and most cost- effective way to make the graphics. Alternatively, using our Lambda printer to print graphics on photographic film (up to 50″ wide) then mounting and laminating produces a superior looking image, perfect for close viewing. These panels featuring the artists were printed directly on the substrate. 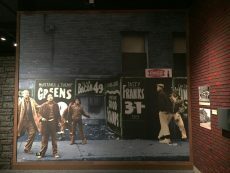 Flerlage’s images provide a unique documentation of the people and places around the city and the museuem used them to create an immersive experience that places visitors on the streets of Chicago during the 60s. To recreate a Chicago street, the museum put together storefronts like a record store filled with replica album covers printed on our 10ft Vutek printer. Mounted on the wall inside the store is a 3D map that shows the cities where migrant blues artists took up new residences as they left the South. A life-sized colorized photograph of a group of young men hanging out on the street is made of self-adhesive vinyl wallcovering and adorns the wall outside of the record store. 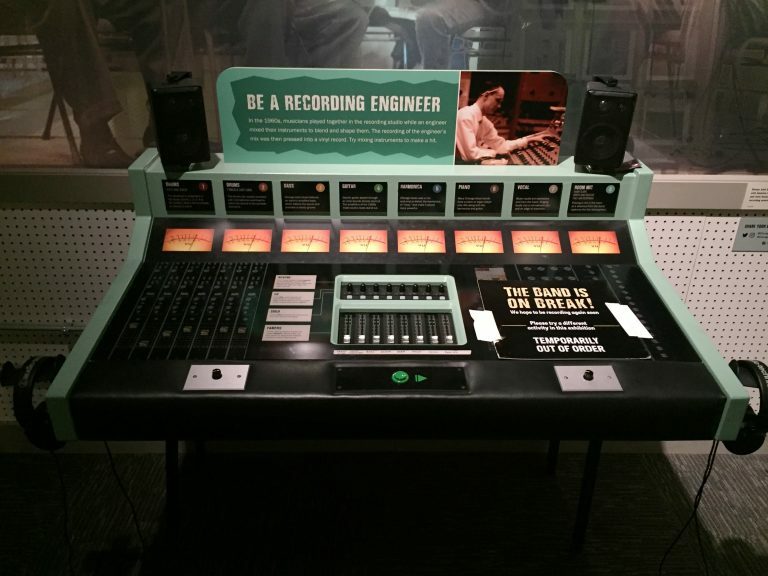 The museum also put together a small recording studio where visitors could learn to play rhythm or lead blues guitar. In another spot, visitors can design their own album cover, and pose with cut-outs of instruments printed on sintra. 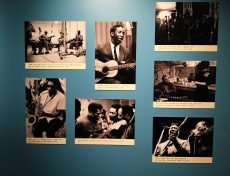 While these features helped to create an immersive environment, no museum exhibit is complete without the narrative panels that tell the real history of the blues scene in Chicago. Colorful panels with photographs provide information about the musicians who gave life to the music that many still listen to today. A great deal of work goes into producing a full-scale exhibition. Designing, curating, editing, building, printing, and finally installing the displays, it takes a large team thousands of hours to create such an engaging experience. While the work Benchmark does is only a small piece of the puzzle, we’re happy we could help Mark and the rest of the Chicago History Museum’s team with the project. Thanks for a great job. We go through handstands/cartwheels in the process, but you guys do great work! I like doing business with you and have recommended you to several people. I know I can rely on Benchmark to get the job done on time and on budget. It’s important for me to know that Benchmark keeps up with the latest technology and equipment to benefit my quality requirements and service needs. They are definitely my best source for graphics! Thanks for all your work on this project. I appreciate your diligence to ensure successful delivery of a quality product. Brian tells me the graphic looks terrific. We went to another company to create two banner displays. We only used them once before they fell apart. Needing the displays for an event in less than 3 business days, we received outstanding service right from the start. Their staff took the time to explain different options as well as show us examples of those options. Not only were they extremely helpful, providing regular updates via email and phone, Benchmark got the job done on time. 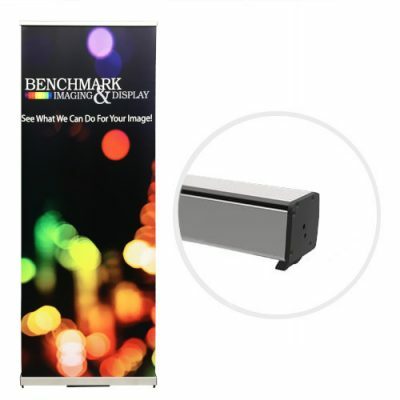 Even with the rush, Benchmark’s pricing is very reasonable and we could not be more impressed with the quality of their work and amazing customer service. We were very happy with their efforts and we will definitely go back in the future. Our marketing firm suggested Benchmark. As soon as I saw the display panels, I could see why. The photos, even though they were blown up to a huge size, look crisp and clear; the colors are beautiful. Benchmark sent them quickly (they rushed to get them to us in time for an upcoming show) and the response we’ve gotten is extremely positive. I now will use only Benchmark – their quality is outstanding; their prices are reasonable..and they’re nice to work with! We’re back from Cancun and it was a smashing success. The pictograms were perfect. They got to where they were suppose to be, on time, in pristine condition. They were a real focal point that teams gathered around all week long. And to have thirty of them back to back to back in the general session room was phenomenal. So thank you for all the expertise and the loving care you and all your staff gave our project. We’re thinking about how pictograms fit into other programs. Thanks so much. Bill, I recieved the banner here in Iowa City, and I am very happy. Excellent look, and I am excited about how lightweight and easy to erect the apparatus is. I look forward to further collaboration between CTS and Benchmark in the future. Just wanted to let you know how much we absolutely love our banners! They are more beautiful than we ever imagined! We are so pleased with them. They had their debut at our Hearts of Valor Ball and they were spectacular! My experiences with Benchmark Imaging & Display have always been pleasant. 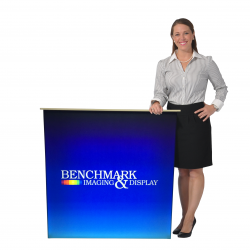 I have used other companies in the past for my tradeshow booths, but Benchmark is now my first choice. The sales reps are extremely helpful and attentive, plus the quality of the product is excellent. We were looking for a cost effective way to produce full color menu boards, and Benchmark had the answer. Their Flat Bed Printer delivered great color and detail, and, because the machine prints directly to the Styrene, we had no mounting or laminating expenses. We use these boards both indoors and out, and they really look sharp. To all this, add friendly service and fast turn-around, and you get a winning recipe with Benchmark.